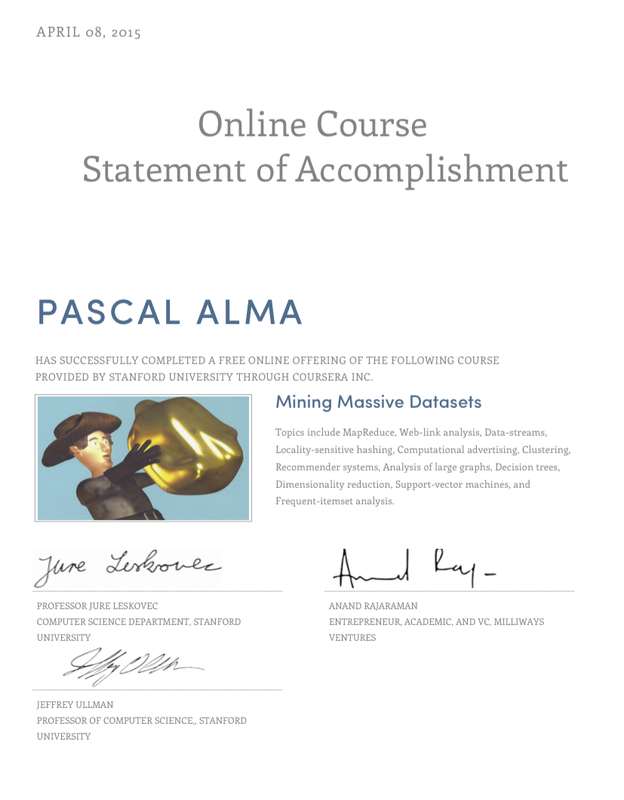 As I mentioned in a previous post I have been following the Coursera course Mining Massive Datasets. Anyone who is not familiair with Coursera should have a look, as they offer a lot of (free) courses that you can follow remotely. This specific course is created by three instructors with a Stanford background: Jure Leskovec, Anand Rajaraman and Jeffrey Ullman. These three are also the authors of the corresponding book ‘Mining of Massive Datasets’ which you can find here. After finishing this course I can say that I learned a lot new stuff. Besides learning the ‘technical’ details about several algorithms used in the training it also gave me an idea how companies like Facebook, Amazon and Netflix could use their (huge) datasets.